The development of Texas colonias dates back to the 1950s. Using agriculturally worthless land, developers created unincorporated subdivisions with little or no infrastructure. Housing is primarily constructed by residents using discarded wood, cardboard or other materials - usually lacking electricity, plumbing and other basic amenities. For more than 135 years, Buckner International (www.buckner.org) has been transforming lives through hands-on ministry. In 2002, Buckner International began to provide innovative programming to support vulnerable children and families living in poverty in the colonias along the Texas/Mexico border (www.buckner.org/rio-grande-valley/). It is our ninth year working with Buckner International in the Penitas Colonia. Each year, beginning in 2011, over 250 Woodlawn regulars have joined one of the teams to use their gifts and abilities to impact the Penitas Colonia. 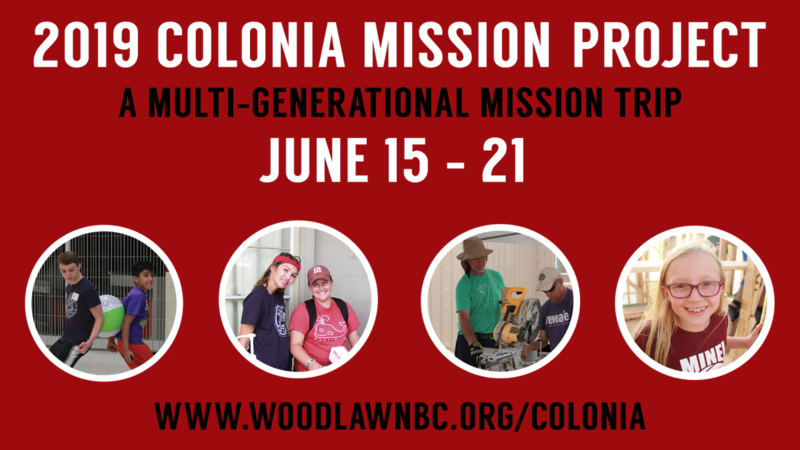 This is your year to be a part of the Colonia Mission Project! Team members will leave Saturday morning, June 15th, from the Woodlawn campus parking lot. The group will return Saturday afternoon, June 21. Colonia Mission Project team members will be housed at Melody Lane Christian Renewal Center (www.melodylane.org). Families with children will have their own private rooms. This summer's mission project is open to adults, families with children, college-age adults, and high school students who have completed the 9th grade. Children/students younger than 9th grade will serve on the Childrens Team with one of their parents. $285 total if $50 non-refundable deposit paid by February 17th. $325 total if $50 non-refundable deposit paid after February 17th while spaces are available. $570 total if $100 non-refundable deposit paid by February 17th. $650 total if $100 non-refundable deposit paid after February 17th while spaces are available. Cost includes lodging, transportation on buses, meals & trip costs while on site. Cost does not include meals while en route on June 15th & 21st. Turn in a sign up form & non-refundable deposit. Make checks payable to Woodlawn Baptist Church. Final balances are due May 5th. Team meetings will provide training as well as opportunities for teams to plan and prepare. Friday, May 19th in the Fellowship Center at 12PM. Individual teams will schedule additional meetings as needed.